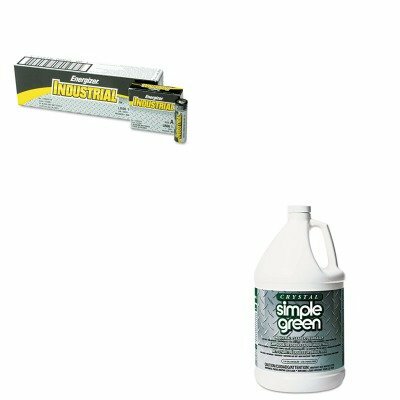 lt;stronggt;SPG19128lt;/stronggt;lt;BR/gt;Simple Green All-Purpose Industrial Cleaner/Degreaserlt;BR/gt;Strong yet safe cleaner removes oil, lubricants and grime from washable surfaces. Rinses easily. Concentrated dilutes with water. For pressure washing and steam cleaning, maintenance. Safe for food-preparation areas. Exempt from OSHA and EPA special handling and personal protection requirements for hazardous materials. Nonabrasive and nonflammable. Application: Machinery Tools Applicable Material: Metal.lt;BR/gt;lt;BR/gt;lt;stronggt;EVEEN91lt;/stronggt;lt;BR/gt;Simple Green All-Purpose Industrial Cleaner/Degreaserlt;BR/gt;Economically power your heavily used, high-current-drain devices. Industrial-grade batteries provide dependable, powerful performance that keeps you going. Alkaline cells are designed specifically for professional applications. Battery Type: Alkaline Battery Size: AA.